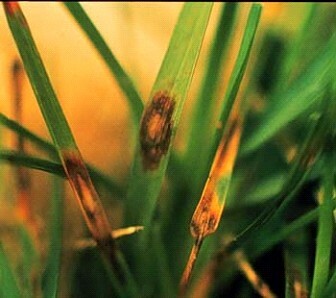 Leaf spot and melting out are diseases of stressed turf, especially Kentucky bluegrass, caused by several species of fungi including Drechslera (Helminthosporium). Leaf spot disease appears during cool, moist weather, spring or fall. The first symptoms of leaf spot are small, purple to black specks on the leaf blades. Some leaf spot can be found on most home lawns in the spring, but it normally does not cause significant damage to the turf. However, newly seeded lawns and certain cultivars of Kentucky bluegrass are particularly susceptible, and a disease outbreak can result in serious injury to the turf. Extended periods of cool, wet spring weather also may trigger leaf spot epidemics on Kentucky bluegrass. Cultural Control: The severity of the disease can be controlled by proper cultural practices that maintain the grass at optimum vigour. Core aerate the lawn once a year (spring or fall) to help reduce thatch buildup and improve soil condition. Core-Aeration is the best method to reduce thatch. Aeration increases the rate of organic matter decomposition. If the thatch accumulates in excess of 1 centimeter, it should be removed. Thatch provides an ideal medium for the fungi to multiply but it also interferes with proper movement of water and nutrients. If clippings are heavy, remove them to reduce thatch accumulation. Mow grass as necessary to maintain a height of 3 inches. Make sure mower blades are sharp. Never remove more than one-third of the grass blade at a time. Mow frequently. Do not mow when grass is wet. During a disease outbreak, the diseased areas should be mowed last and clippings should be removed, to reduce the spread of disease. Avoid excessive applications of fast release nitrogen fertilizer, which induces tender, succulent growth and more susceptible tissue. Apply nitrogen according to soil test results or at the rate of 1 pound per 1,000 square feet 3-4 times a year. Never apply more that 4 pounds of nitrogen per 1,000 square feet in an entire year.